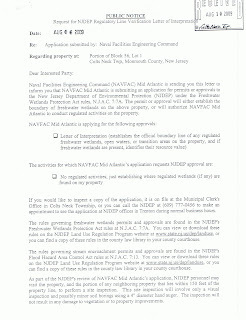 NOPE has obtained a copy of NAVFAC's (the Navy's facilities management arm) letter of intent to apply for permits on its planned civilian access route thru Weapons Station Earle and to the Laurelwood housing development - a perceived first step in the Navy's plans to begin work on the project. 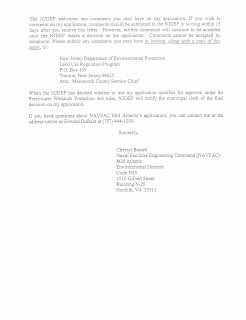 We have attached a copy of the letter submitted August 6, 2009 to the DEP, though the language does not make clear whether the Navy is simply lining up its environmental maps with those of the state's environmental watchdog, or whether this is a sort of "fast-track" effort to obtain permits. If you recall, it appears that the Navy has until April 30, 2010, to fully clear the route (i.e. remove trees, handle wetlands issues) upon which Laurelwood Homes LLC, the owner of the 300 homes at Weapons Station Earle to be converted to civilian housing, would then pay for and pave the road before opening up the homes for rental to any civilian. Unless the DEP officials we met and our state representatives blatently lied to NOPE that the DEP will not fast-track the permits, we suspect that the Navy will breach its contract with Laurelwood (i.e., unable to complete the clearing work by the end of next April, per terms of the contract) and Mrs. Fischer, owner of the 300 homes, will sue the Navy, sending the fate of the proposed civilian housing project into litigation. NOPE will remain in contact with District 12 Senator Beck and Assembly members O'Scanlan and Casagrande on this issue, asking them to watchdog the DEP to ensure that NAVFAC is not given fast-track permits or precedence over other applications in the DEP's permit queue.